Since 1951, the Journal of Japan Oil Chemists' Society had been a leading source for technical papers related to the fats and oils industries. Editor-in-Chief: Professor Osamu SHIBATA, Dr. Sc. 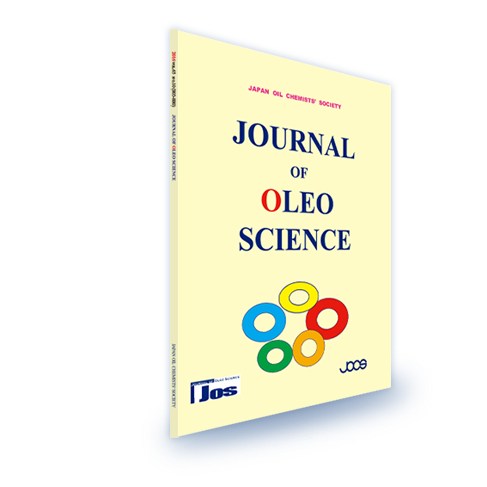 The Journal of Oleo Science (JOS) will turn 15 in 2015. We have updates regarding our Editor-in-Chief and the Executive Board of Editors team. Professor Kazuo MIYASHITA, the former Editor-in-Chief (EIC), is now the president of the Japan Oil Chemists’ Society. His contributions in editing the JOS have ensured the advancement of our research in oleo science throughout the world. The original intent of those who founded JOS was to create a journal that covers all areas of oleo science, from theory to experimentation and developments in industry. This approach countered the prevailing trend toward the creation of journals. Those of us at JOS have adopted this objective wholeheartedly and successfully, crossing the boundaries of standard disciplines. In 2015, the JOS will introduce two new categories: “Nutrition & Health Function” and “Essential Oils & Natural Products.” Today, almost every part of the submission process for JOS is conducted electronically via the Web. Currently, we receive approximately 300 submissions per year; as EIC, I expect this number to increase steadily, along with improvements in the quality of papers published by the journal. Of course, other things also have to change, including the accept/reject ratio, impact factor, and country of origin of manuscript authors. In an effort to help our authors produce better manuscripts that are also more useful to our readers, we have developed new, comprehensive author guidelines. Because we are seeing an increase in international contributors, the proportion of articles published by these contributors will also grow. Therefore, we are adding editors in many countries as “Editorial Board Members.” Other ideas will be announced as the journal’s coverage evolves over the next several years. The team of Executive Board of Editors and I will work hard together to ensure that the JOS fosters new ideas and stimulates interdisciplinary exchanges.